The yellow glove puppet sold for a whopping £14,500, smashing the previous world record paid for a Sooty. The original Sooty was bought by Harry Corbett on Blackpool’s North Pier in 1948 to entertain his kids. He paid seven shillings and six pence (37.5p) for it and after covering the bear’s nose and ears with soot the legendary TV character was born. Today another surviving puppet - which starred on Corbett’s TV show in the 1950s - set a new world record when it was snapped up by a private bidder. Auctioneer Charles Hanson said: “It’s an astonishing figure and I’m delighted for the sellers. The original Blackpool-bought puppet set a world record in 2008 when magician and presenter of the Sooty Show, Richard Cadell, paid £3,100 for one. Mr Hanson added: “Sooty was invented in Blackpool. “Harry Corbett bought the puppet on Blackpool’s North Pier in 1948 for seven shillings and six pence to entertain his children on holiday. The Sooty puppet belonged to Dr Steven Abbott, 58, from Tewkesbury, after Harry Corbett gave it to his father, Blackpool-based musician Arthur Abbott, who had the stage name Art Johnson. Corbett sent a letter to Mr Abbott, on Sooty headed notepaper, dated September 16, 1957, which read: "Just a line to say thank you very much for the list of tunes which came in very, very handy on the cruise. "I have great pleasure in sending you one of the Sootys which I have used on television. "Actually, he was in a programme where he got rather messed up, and he has since been washed. "However, when he has a brush up I am sure he will look very nice. Again, many thanks and best wishes – Harry Corbett." 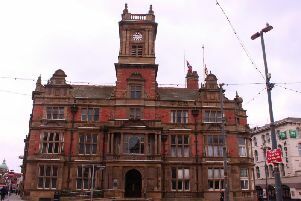 The pair got to know each other in Blackpool’s heyday in the 1950s and 60s when stars like Jimmy Tarbuck and Morecambe and Wise also performed in the resort's theatres.